We believe in small. By locating ourselves in a specific place, where we both live and work, we create our own “third place” where people can gather and connect. By having one café, we actively join in the conversation, participating rather than observing from the outside. With all due respect to our amazing graphic designer, Kopplin's is not a brand. It is a place, our place. We invite others into it, and we are better for their presence. Anyone can make coffee, but we are truly blessed that in having done so we are surrounded with a community who choose to join us each day and engage with the environment around them. While we (Andrew & Amanda) are an integral part of Kopplin’s, we are fortunate to also share the work of the café with our talented employees. Our commitment to them is to create a stable and fulfilling role for those who choose to stay with us. In doing so, we make our coffee house a better place for every person who sets foot inside. As we seek to create this alternative to standard ‘service industry’ chains, we choose to provide a fair compensation to these people who bring beauty into our lives with the creations of their hands. We go beyond “living wage” ($9.69 in Ramsey County), to a wage that we feel is actually liveable based on our own experiences, validating their work and creating an equitable pay environment. We value community beyond the point of ease. We are always looking for ways to interact more meaningfully with those around us, because the only way to form true connection or profound change is by being present. We love our shop, but it’s not an island. It needs the world around it, and seeks to be a positive part of that world. The Power of Change: buy local, give local. 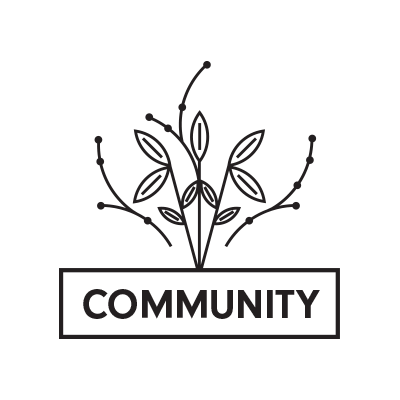 Born in 2014 out of a long conversation about what it means to be in one place, this project seeks to keep our dollars truly in the community by using them to purchase locally-produced goods for neighborhood organizations. We couldn’t really conceive of the money that was leaving our city and going into massive international credit card operations. For our part, we decided that 1% of all cash sales at the shop would be donated locally in the form of regional products from a local distributor. We focus on providing good, real food – the same food we feed our family – to the Keystone Community Services Food Shelf on University Avenue just off Prior Ave, right in our neighborhood. Share a Cup: open the door. Late in 2017 we started thinking about ways to expand the circle of our community at Kopplin’s. What better way than through the welcome of a warm beverage? We started a program where customers coming into the shop can give a little extra at the register towards a group account. All the money on the account is used to buy Kopplin’s gift cards, which are then distributed to patrons of the Keystone Food Shelf. We love knowing that more people can join us for a cup of hot coffee, a bag of coffee beans for home, a loaf of bread or a special pastry on a long day - and it’s all possible through the accumulation of small acts of generosity. Sign up to receive news, special offers, and seasonal menu updates. Thank you! We’ll keep you updated with news and special offers.